Click here for a high resolution version of this picture. I call this “eggs and things”. It’s sort of like a reverse frittata. The actual vegetables used don’t matter too much, as long as they’re fresh and in-season. Made with potatoes and onion, this becomes la tortilla de españa. 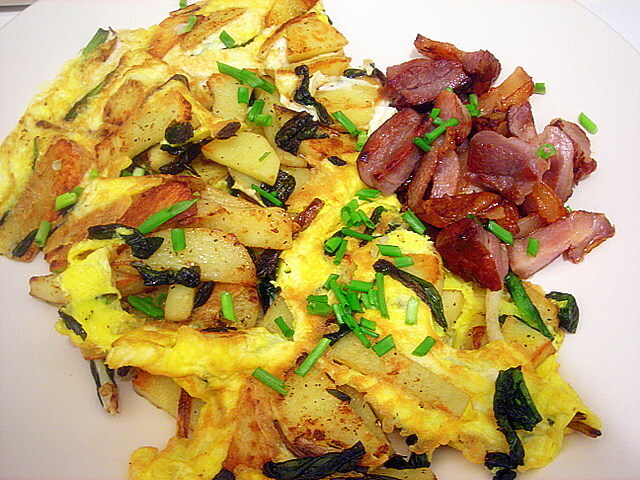 Here’s a version I did back in April — with ramps and Yukon potatoes. This preparation contains plum tomatoes, shallots and baby spinach. It’s delicious. Melt butter in a large skillet over medium-high heat. Add shallots and cook, stirring frequently or until translucent, about 1 minute. Add tomatoes, a scant pinch of salt and pepper. Sauté or until tomatoes disintegrate slightly and form a light sauce. Reduce heat to medium. Season to taste. Once tomatoes are thoroughly cooked but not yet completely liquid, add the spinach. Cook until spinach barely begins to wilt, about 1 to 2 minutes. Add a couple of beaten eggs; pour over the vegetables. Cook until eggs are set. Stir to break eggs up — the eggs should be somewhat “shredded”. Check seasoning, then serve immediately. Time: 20 minutes (including prep time). Makes enough for 1 serving. Pair with a baguette and a glass of white wine for a light dinner. * Substitute regular spinach, however you may have to adjust the cooking time slightly. 10 Nov	This entry was published on November 10, 2009 at 4:52 am. 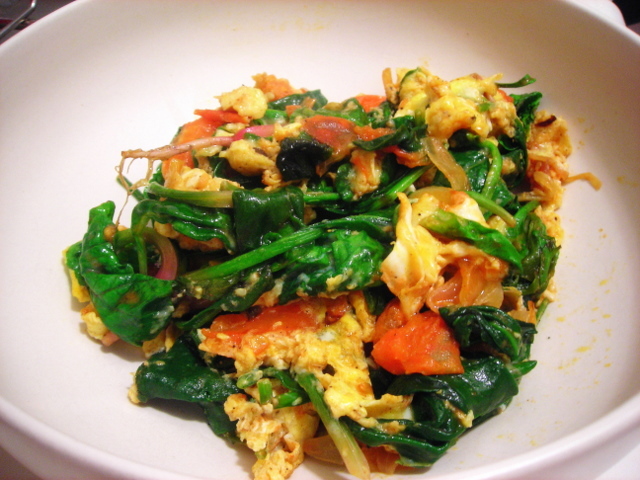 It’s filed under autumn, food, general, vegetarian and tagged dinner, eggs, quick and easy, spinach, tomato, vegetarian. Bookmark the permalink. Follow any comments here with the RSS feed for this post. I always make frittatas, but I think I like your eggs and things better! I love eggs, period. Now I’m hungry looking at those pics. So, somehow, my cold cereal and dry toast with OJ isn’t cutting it this morning.